In a world where everyone is always trying to get ahead at work, you feel like you’re falling behind. You consistently feel tired, and your focus never fails to wander right when you need it the most. It’s affecting your ability to perform on the job and even your interactions with your coworkers. What is happening? Everyone will admit to being a bit sleep-deprived at some point as they experience the stresses of life, a cold, or child rearing responsibilities that kept them up the night before. But chronic sleep deprivation has far-reaching consequences on the job, affecting everything from your memory, to your focus, to your emotions and more. Is sleep deprivation the underlying cause of your problems at work, and if so, what can you do about it? Stress: Stress is a normal part of being human, but if stress in your personal or professional life consistently keeps you tossing and turning, it might be a good idea to see a specialist or practice a few techniques to relieve anxious thoughts, such as exercise, meditation or even practicing gratitude. Health issues: There are a number of physical conditions that can impact our quality of rest, from actual sleep disorders to other issues such as kidney disease and heartburn. When one part of the body is not doing well, it tends to affect other aspects of our health, too. Life changes: It could be a new baby, a move or a job change — big life shifts tend to keep us up at night. Poor lifestyle habits: Lack of exercise, watching screens / playing video games late at night, and a poor diet can all contribute to low-quality sleep. Alcohol consumption: Alcohol is a depressant that can make you feel drowsy initially, but it quickly metabolizes during sleep. Your brain soon “rebounds” from this depressed state, leading to more frequent awakenings during the night, including microarousals that you may not notice but that can greatly impact your sleep quality and how you feel the next day. Caffeine: The National Sleep Foundation reports that in one day, the average person drinks about three 12-ounce caffeinated beverages. For most, coffee takes an average of 4-6 hours to be completely cleared from the body. Any caffeine consumed after 12 p.m. can impact your rest that night. Whatever the cause, there’s no question that sleep deprivation has a significant negative impact on work productivity. 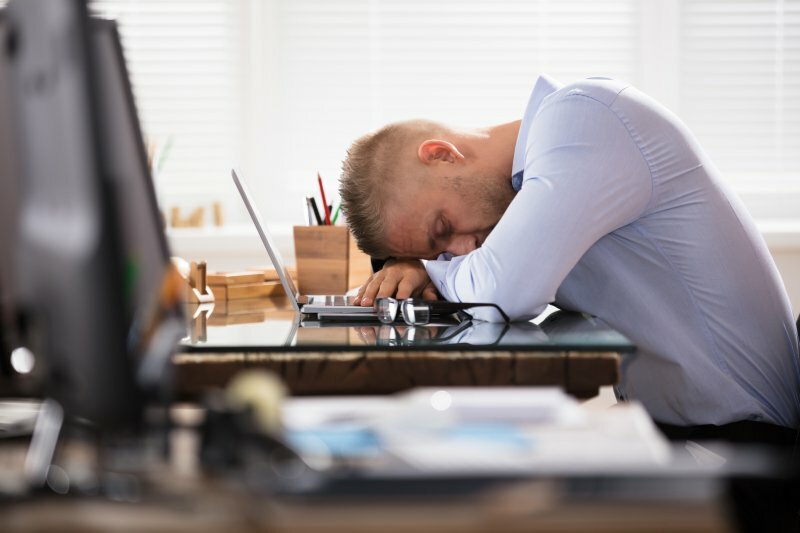 A recent study by RAND Corporation uncovered that the U.S. experiences the highest economic loss due to insufficient sleep compared to other countries — up to $411 billion a year and the equivalent of about 1.23 million workdays. Both attention and working memory are linked to the functioning of the frontal lobes in the brain, which are very vulnerable to sleep deprivation. When these two functions are impaired, our response times slow, and it becomes more difficult to complete everyday tasks. Nuanced, complicated decisions are made more difficult by a lack of sleep. The ability to balance risk and reward becomes impaired, and people are more likely to make impulsive choices that lack self-control and good judgement. Selective attention is the ability to focus on specific information when other things are happening around you. One study of two groups — a sleep-deprived group and a group that was well-rested — found that selective attention was much harder for those that were sleep-deprived. Research by the Hult International Business School found that 84% of those surveyed reported that they felt more irritable as a result of poor sleep, which can affect decision-making on the job and interpersonal interactions. A different study with 18 healthy, young adults found that, when shown a series of facial expressions ranging from friendly to threatening, individuals who had been awake for 24 hours perceived more faces to be threatening. The inability to recognize and react to the emotional state of others seems to be a consequence of poor sleep that can affect relationships. All of these factors play together when you’re sleep deprived to make you less than the best version of yourself on the job. If you’re experiencing them, it might be time to look into a solution for sleep deprivation to make sure you’re getting the rest you need. Avoid screens an hour before bedtime. Keep a consistent sleep / wake schedule, going to bed and waking up at the same time every day — and only sleep in an extra hour on the weekends. This regulates your body’s clock, helping you begin to get sleepy at the same time every night. Exercise– vigorous activity will tire you out the most, but even light exercise will help you fall asleep faster. Keep your bedroom between 60 and 67 degrees. As you fall asleep, your body temperature cools to prepare for rest and a lower temperature in the room will help facilitate this function. Practice a consistent, relaxing bedtime ritual – like taking a bath, brushing your teeth, and cozying up to read. These tips are a great starting point to relieve sleep deprivation, but if you’ve tried a few of them and still find yourself yawning, irritable, and inattentive throughout the day, it might be due to a different issue. Sleep apnea affects an estimated 22 million people across the U.S., and the condition, which causes sufferers to repeatedly stop breathing during the night, contributes significantly to sleep deprivation. Every time a sleep apnea patient experiences this cessation in breathing, sleep quality is disrupted, which can cause persistent fatigue. If you frequently experience sleep deprivation or your partner is complaining about your snoring, it may be time to see a sleep specialist to determine a solution that will start improving your rest and quality of life. Dr. Jeff Rodgers and the team at Sleep Better, Georgia can assess your sleep issues and help you finally get the rest you deserve. Request a free consultation online today or contact us to learn more.